Green fluorescent protein (GFP) was isolated and cloned from the jellyfish Aequorea victoria. This protein gives a characteristic green fluorescent glow under long UV light, and it has effectively been used as a tag to follow the localization and function of proteins in cells. 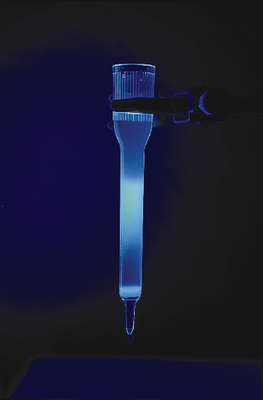 In this experiment, the unique fluorescent property of GFP will be used as an assay during its purification from an E. coli extract. Column fractions which contain GFP will be identified by green fluorescence. As an optional activity, purified protein fractions can be submitted to denaturing SDS polyacrylamide gel analysis to estimate the purity and size of the gfp protein. Includes materials for six groups sharing three gels. Required, but not included: vertical gel electrophoresis apparatus, power supply, 5-50mL micropipets, and polyacrylamide gels are required. Kit is shipped at room temperature, but some components require -20°C storage upon receipt. Note: Coupon included for perishable materials. Redeem by mail, fax, or email.